A photo of Feky Sumual on his Facebook page. On October 9th, 2015, a man named Feky Sumual walks into Stateline Guns, Ammo & Archery, a gun shop in Plaistow, New Hampshire, where he buys seven 9-millimeter handguns. Because of the number of guns involved, and because 9-millimeters are common in gun smuggling rings, the Bureau of Alcohol, Tobacco and Firearms begins to investigate. Agents stake out the Dover address Feky Sumual provided on the purchase forms, but for weeks, he doesn’t show up at the apartment. “And while that surveillance was going on, we got a bit of a break in the case,” says William Morse, an assistant United States Attorney in Concord, New Hampshire. The woman who walked into the Dover Police Station on November 11th, 2015, was Feky Sumual’s wife, Tuti Budiman. The information Budiman wanted to share with the police was for who exactly her husband was buying those handguns. The Indonesian version of the Secret Service, officially known as the Presidential Guard. By walking into that police station, Budiman was spilling the beans on an international gun trafficking operation involving the military of a country 10,000 miles away...an operation that was likely going to land her husband in jail. But why, exactly, would she turn him in? “Well, hell hath no fury like a woman scorned,” says Richard Monteith, a criminal defense lawyer who worked on this case. Also at Fort Benning at this time was an American soldier named Audi Sumilat. Sumilat is the nephew of Feky Sumual, the Dover man. Both are naturalized U.S. citizens, both born in Indonesia. Sumilat enlisted in the United States Army in 2003. Sumilat deployed four times: three tours in Iraq, and once in Afghanistan. His Humvee on one deployment hit an IED, leaving him with PTSD and a traumatic brain injury. In 2014, Sumilat was a sergeant based at Fort Benning, when members of the Indonesian Guard apparently approached him. They wanted to take some American guns back to Indonesia, but couldn’t legally buy them. “Sumilat and these Indonesian nationals that he met at Fort Benning hatched a plan together, and the plan was to illegally buy firearms in the United States,” says Morse. Sumilat would make straw purchases of handguns picked out by the Presidential Guard, who would wire him the money, plus a little extra for this troubles. 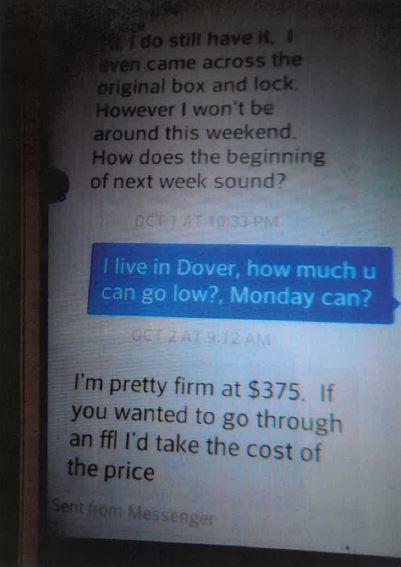 Images from Feky Sumual's phone, turned in by his wife to the Dover Police Department. He would then deliver the guns to either New York or Washington, D.C., where they would pick them up, “and then illegally smuggle them from the United States to Indonesia on the official government aircraft of the President and Vice President of Indonesia,” says Morse. That’s right, take the guns home on Indonesia’s version of Air Force 1. But, when Sumilat got transferred from Fort Benning in Georgia to Fort Bliss in Texas, suddenly the drive to New York to deliver these guns was too long. So, Sumilat called his uncle in Dover, New Hampshire, and asked he if wanted in on the scheme. Feky Sumual, the uncle, was at this time working night shift at a manufacturing facility in Hampton. He took up his nephew’s offer, and began buying guns at stores in and around the Seacoast region. Meanwhile, Sumilat bought guns in Texas, and mailed them to his uncle. Nobody is sure exactly how many. “I think it is fair to say there were at least 40 to 50,” says Morse. The first known gun delivery took place on September 28th, 2015. Members of the Indonesian Presidential Guard were in New York for the opening of the United Nations General Assembly. Sumual loads the guns into a duffle bag and drives them from New Hampshire to Manhattan. Around 10 p.m., Feky pulls up to the Indonesian Mission on East 38th Street to make the handoff. Sumual hands over the guns; the Guard members hand him $1,300. There were at least three of these clandestine handoffs, according to court records, including one in Washington while the president of Indonesia was in town for an official state visit. When that wrapped up, the guns were apparently loaded onto the President’s plane, and bound for Indonesia. All of this, of course, leads to the question: what exactly were the Indonesian Presidential Guard members going to do with these guns? Morse says handguns in Indonesia are akin to rare coins: not illegal, just hard to get, and therefore valuable. But nobody really knows for sure what the Presidential Guard members were going to do with these guns. Attorneys for Sumual and Sumilat recommended their clients not speak with NHPR for this story. It is clear, though, that money was a motivation for them. But considering the risks, Sumilat wound up pocketing less than $3,500. “That’s all he made,” says Monteith. After Feky Sumual’s wife walked into the Dover Police Station to turn in her cheating husband, the two men would quickly admit to their scheme. After reaching a plea agreement, each were sentenced to approximately 18 months in jail. While the case received some media attention in the U.S., it wasn’t a huge scandal in Indonesia. The President of Indonesia’s spokesman denied that the guns were carried from the U.S. to Indonesia on the official plane, and the three identified members of the Presidential Guard were each disciplined, though, they weren’t removed from their positions. The State Department says it can’t confirm if it is still pursuing charges against those Guard members, but after what were described as “intense diplomatic negotiations,” prosecutors say they did recover and destroy 22 of the handguns. Audi Sumilat began serving his prison sentence in September at a low-security facility in Texas. His attorney, Richard Monteith, says his client’s years of service in the Army likely helped reduce his jail time. “He’s a good person who just made a drastic mistake,” he says. The uncle in the case, Feky Sumual, didn’t receive bail, and was released in May of this year after serving 17-months in Merrimack County Jail. Curiously, there to meet him outside the court was his wife, Tuti Budiman. They are again living together in the Seacoast region. This weekend at the Pine Hill Cemetery in Dover, the dead will come back to life...sort of. 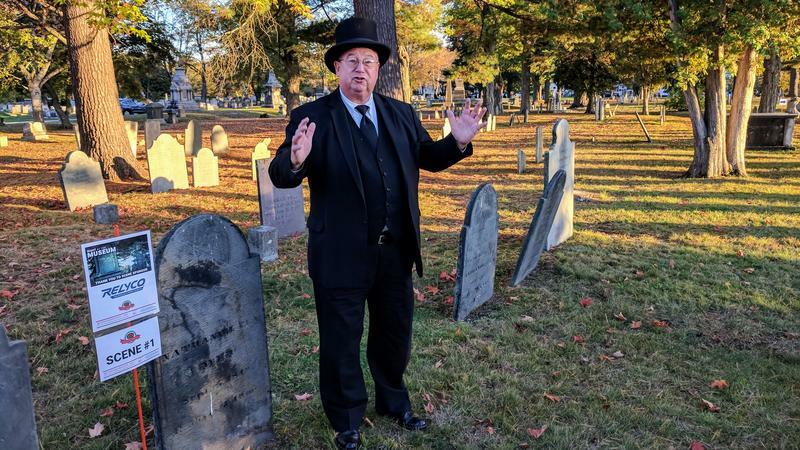 As part of the Woodman Museum’s "Voices from the Cemetery" event, local volunteer-actors will portray some of the famous -and infamous- Dover residents buried in the centuries-old cemetery. NHPR’s Jason Moon caught up with the actors as they were rehearsing earlier this week and sends this postcard. A corrections officer at the Cheshire County Jail has been arrested for smuggling drugs into the facility.